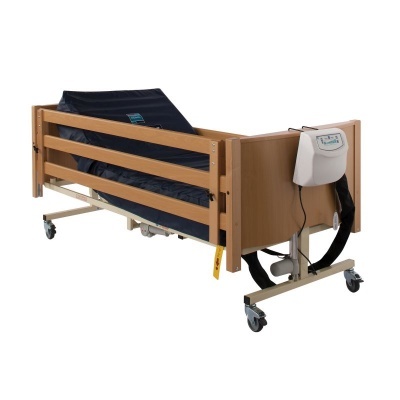 Sidhil Bradshaw Beds can be supplied with side rails, but standard height side rails may be insufficient for deeper mattresses or particular patient requirements. The Sidhil Bradshaw Bed Side Rail Height Extension Kit solves this problem by allowing the side rails to be extended in height without compromising any of their features. This allows carers to adhere to side rail safety standards without the need to buy an entirely new side rail set. Many mattresses with significant depth will elevate the patient to a level where side rail safety standards are no longer being met. This Extension Kit solves this issue by increasing side rail height to ensure compliance with rail standards. This kit makes height extension simple, and can be attached to existing side rails with minimal hassle. Please be advised that the Sidhil Bradshaw Bed Side Rail Height Extension Kit is usually delivered within 1 week of your order being placed. We would advise you to consider this delivery estimation before placing your order. For more information, please contact our Customer Care Team at 020 7501 0592.